There are many things that make oriental food desirable. Of course, the rich and pleasant flavors that result from the combination of exotic spices and vegetables is one of the reasons. But the perfect balance that oriental cuisines strike almost every time between the different categories of food classes such as vegetables, carbohydrates and proteins, is not less important. One of the major problems of traditional North American and European cuisines is the presence of too much fat. The stir-fry cooking that is at the heart of oriental cuisines uses a very small amount of vegetable oil, and therefore has the advantage of cutting fat content intake as much as possible. As a matter of fact, wok based stir-frying is a medically recommended way of cooking for healthy living. This brings us to the subject of this review: Which type of wok provides the best cooking and maintenance characteristics? More specifically, we will compare the carbon steel, cast iron and clad stainless steel woks to help you make the right decision before buying your own wok. 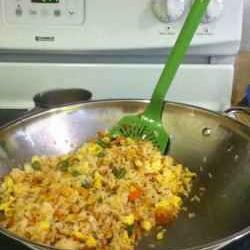 Plenty of people will tell you that for oriental home cooking carbon steel woks are the best. Don't believe that! Yes, they are excellent as far as heat conduction and performance is concerned. But they are a real pain when it comes to cleaning, and no matter how well you season or clean them, after awhile surface degradation and rust sets in, and you will need to get a new one. They are great for Chinese restaurants where they are better equipped to deal with these types of woks and where they prefer not to spend too much on equipment. But they are certainly not convenient for home cooking. You will find below important information on the various types of woks and on the reasons that make the clad stainless steel wok the best for home use. A wok is a versatile usually round-bottomed cooking vessel that first originated in China, used in the past mostly in East and Southeast Asia, but almost everywhere today. Woks are mainly used for stir-frying, but can also be used for steaming, braising, stewing, or even deep frying . The long handle of the wok which is available in most types allows the cook to stir-fry comfortably the ingredients of his recipe without burning the hand. But there are also woks with round handles on each side. Because woks are traditionally round bottomed they are most efficient on gas stoves since the roundness of the wok allows good transmission of the heat. Therefore, if you have a gas stove, you should opt for a round bottom one. However, nowadays one can also buy flat bottomed woks to suit the burners of electric ranges. Though these can not be as efficient as round bottom woks, they can still yield more than acceptable results. In any case, for people with electric ranges flat bottomed woks represent the most reasonable choice. First, we'd like to say right off the bat that we do not recommend the Teflon coated woks as they present some major problems: They are easily scratched, and, at temperatures above 450°F (230°C) which are required for good stir-frying, the Teflon coating can break down chemically. Worse yet, at temperatures around 660°F (350°C), they may even produce vapors that could be harmful to health. Traditional woks are either made of carbon steel or cast iron. Carbon steel woks are the most widely used types and vary in quality and style. At the lower end, we find carbon steel woks made of a single ply and stamped directly from a piece of steel. These woks are more prone to deforming with extended use, and they may have hot spots which makes cooking with them more hazardous. The best carbon steel woks are made of two sheets of carbon steel and hand forged. Authentic Chinese cast iron woks are thin and weigh about the same as carbon steel woks of comparable size, but these woks are better than carbon steel woks as far as heat retention and heat distribution are concerned. They also tend to form a more stable carbonized layer of seasoning which makes them less prone to sticking and therefore, relatively speaking, easier to clean. Cast iron and carbon steel woks are relatively inexpensive, yet excellent for cooking efficiency. But each type has its problems as well. The carbon steel woks are more difficult to season, and the carbonized coating can easily be removed making the food more prone to sticking and the wok harder to clean after each use. On the other hand, the cast iron woks are relatively fragile and can be prone to shattering if dropped, or, if they are sturdily made, they could be slow-heating and slow-cooling. Cast iron and carbon steel woks are best suited for Chinese restaurant kitchens where cooking efficiency is highest in priority, which are equipped with the right type of powerful professional gas stoves that get the most out of these woks, and where they usually have a large number of woks available to circumvent the problems described above. For home cooking, the main issue with both carbon steel and cast iron woks is really the surface degradation (permanent stains, etc.) of the wok that eventually occurs, and the effort required for cleaning after each use, which you will no doubt find to be too much of a hassle. For home use, the best wok is the clad stainless steel wok as explained below. Clad stainless steel woks encapsulate a thick layer of aluminum core between two sheets of stainless steel. Thanks to the aluminum core, they perform extremely well, and thanks to the stainless steel finish, they are very easy to clean and will last a lifetime. One additional very useful feature found in many models of this type of wok is the specially designed stay-cool handles which do not absorb heat when cooking on the stove, and which can be held with bare hands with no danger of getting burned. As it can be expected, these woks cost quite a bit more than the carbon steel or cast iron woks, but the ease of upkeep and the incredible performance of these woks are well worth the extra money. We claim without any hesitation that when you compare woks for home use, the clad stainless steel wok is the one to choose. The above review of the various wok types for home use provides enough arguments to opt for the clad stainless steel woks for durability, performance and ease of cleaning, if you don't mind paying a bit more. Note that, as mentioned, a lot of people will tell you that cast iron or carbon steel woks are better for authentic Chinese cooking as they are the types used by most Chinese restaurants. That may be true as far as cooking performance is concerned, but given their maintenance and cleaning problems, we recommend the clad stainless steel woks which also display excellent cooking performance (note also that as explained above Chinese restaurant kitchens are adapted to using carbon steel or cast iron woks, which will not be the case with your kitchen!). We want to stress again here the word "clad" which refers to woks that have a thick layer of aluminum core encapsulated between two sheets of stainless steel, required for good performance, as non-clad stainless steel woks will not perform well at all. We hope that the above information will help select the right wok for your kitchen. 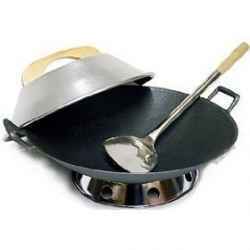 You will find below a good choice of woks from all three types that you can purchase on Amazon. However, when you choose your future wok, make sure that you get a round bottomed or flat bottomed wok depending on whether you have a gas or electric range. Also choose, if possible, a model with stay-cool handles that can be held with bare hands, and with no danger of getting burned .